Ford India is gearing up to launch the Ford EcoSport Signature and EcoSport S models soon in the country. 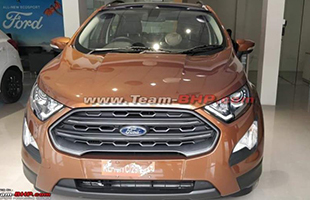 The former is based on the EcoSport’s Titanium version and comes with a sportier rear spoiler, black front grille bars and roof rails and a black fog lamp bezel in front. There are 17-inch machined face alloy wheels and blue seat stitching in addition to the anodized blue interior trim.